High response rates in refractory B-cell leukemias and lymphomas have been achieved recently using chimeric antigen receptor (CAR) T cell therapy by targeting the CD19 B-lymphocyte antigen. CAR-T cell therapy is a highly personalized treatment that requires the incorporation of a synthetic CAR gene to a patient’s T cells. This process is carried out by a lentiviral system. The production of the lentivirus requires several essential manufacturing steps, including i) manufacturing plasmid DNA encoding the synthetic CAR gene and ancillary plasmids, ii) delivery of these plasmids into producer cells to generate virus, and iii) harvest and purification of the generated virus. A highly collaborative, multi-disciplinary, and multi-geographic BioCanRx program, which includes the Ottawa Hospital Research Institute (OHRI) and the BC Cancer Agency (BCCA), has been established to create a pipeline for CD19 CAR-T cell therapy in Canada. Within the larger program, Dr. Rob Holt’s group (BCCA-Vancouver) is responsible for two main aspects: i) the design, and pre-clinical validation of the lentiviral delivery system and ii) the design and validation of the CAR-T construct, including the generation of the DNA for use in lentiviral production by the Biotherapeutics Manufacturing Centre (BMC), OHRI. Both groups faced a similar challenge – to generate large amounts of lentivirus – by BCCA for additional validation and design optimization work, and by BMC to generate sufficient quantities needed for clinical use. Facilitated through the BioCanRx lab exchange program, Dr. Eric Yung from Dr. Holt’s group visited BMC in Ottawa in November 2017, which led to mutually beneficial outcomes, allowing for both parties to make great strides to overcome their challenges. 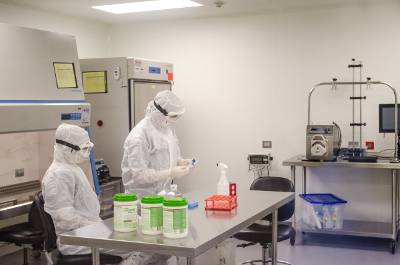 BMC has extensive expertise with large-scale GMP manufacturing of viruses, and Eric’s visit allowed a better understanding of how individual small-scale processes can be scaled-up, or which alternatives may exist. Eric was able to have in-depth discussions with the GMP staff regarding limitations with respect to large volumes of viral supernatant. There are significant challenges when scaling-up from milliliter scale production to liter scale production. These challenges include determining the types of vessels that handle the cell culture, to virtually all steps of fluid handling and downstream purification of the viral supernatant. Eric was able to see BMC’s facility and interact with their staff to better understand these steps. He was able to explore BMC developed protocols with BMC personnel to better understand how to adapt it to the BCCA facility. BMC staff was able to engage with Eric regarding lentiviral biology, titering, as well as allowing for easy data sharing and real-time discussions on results from various studies. The in-person interaction and communication between Eric (BCCA-Vancouver) and BMC staff, enabled by the BioCanRx lab exchange, was very beneficial in advancing the process development efforts of this program. Dr. Piriya Yoganathan is a post-doctoral fellow at the Biotherapeutics Manufacturing Centre, Ottawa Hospital Research Institute involved in the process development efforts of lentivirus manufacturing for CAR-T cell therapy. She completed her PhD at Queen’s University in the Department of Pathology & Molecular Medicine with a specialization in cancer research. Dr. Eric Yung is a staff scientist at the BC Cancer Agency in the Genome Sciences Centre lab of Dr. Rob Holt. Dr. Yung did his PhD at Albert Einstein College of Medicine working on understanding the HIV-1 life cycle and carried on postdoctoral research on gene therapy and the development and use of viral vectors. Currently he is overseeing the design, construction and pre-clinical testing of lentiviral vectors for the multi-site pipeline for CAR-T development.